Border Patrol Sector Supervisor Jorge Rivera watches as construction workers build a portion of 9-meter-tall replacement fencing in Calexico, Calif.
A long line of people, winding past a chain-link fence and a turnstile, distinguishes the boundary separating San Luis, in the U.S. state of Arizona, and San Luis Río Colorado in Sonora, Mexico. Otherwise, it would just appear to be desert. At the U.S. port of entry, temporary farm workers leave their families and queue up daily before dawn to catch a bus to the fields, just outside town. Residents from Arizona join them. While others describe a sense of tranquility on either side of the border, there is an underlying tension, too. Drug trafficking is of particular concern, but not everyone wants to talk about it. "It’s calm here and there,” says Heriberto González, a longtime resident of San Luis, Ariz. Like other residents of the border town, he is not bothered by the deployment of the National Guard to the area either. A mix of workers on temporary visas, permanent residents, and U.S. citizens with Mexican family members, residents of San Luis, Arizona, say it’s normal to have a foot on both sides of the border. “It’s good to end that because it’s dangerous for anyone here along the border,” said Candelario Vizcarra, a San Luis farmworker who lives in Mexico. Others with business ties in San Luis agreed with Greg, who didn’t want to share his last name with VOA. But they were careful not to voice their opinions out of concern they might appear to be anti-immigrant. María Herrera, a minimum-wage farmworker, mother, and permanent resident in Arizona, agrees that drug trafficking is a problem and that it is affecting the town’s children, some as young as 12. Creating more well-paying jobs would be her suggestion. Absent that, Herrera is skeptical of the National Guard troops’ presence. She worries about the effect of a militarized border on the undocumented. “Like all Latinos, we worry about what happens to other families like our own, because one way or another, many are family or relatives of some friend of ours that we have in common. 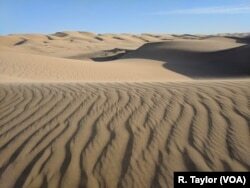 The Imperial Sand Dunes grace a stretch of the 127 kilometers that separate San Luis, Ariz., and Calexico, Calif. In Calexico, California, 127 kilometers northwest of San Luis, across subtropical desert, a section of 9-meter bollard-style replacement fence towers over the palms and brush to its south. Border Patrol sector supervisor Jorge Rivera says he is grateful for the upgrade because of another issue: the safety of his agents. “Criminal organizations come over and they attack us with rocks; they throw any type of object toward us to avoid us apprehending any type of illegal activity,” Rivera told VOA. In fiscal 2017, the U.S. Border Patrol in the El Centro Sector of southern California reported 21 assaults against agents and seized more than 200 kilos of cocaine, 690 kilos of methamphetamine and 70,000 grams of heroin. San Luís Río Colorado, Sonora, Mexico, as seen through border fencing in Arizona. But unlike San Luis, some residents concerned about illegal immigration in El Centro bring up a line of reasoning more in tune with pro-Trump areas of the country, including the narrative that those crossing the border illegally are an economic burden on society. Ironically, Andrade admits to once being homeless and an undocumented immigrant himself, crossing multiple times from Mexicali until he successfully evaded the U.S. Border Patrol and settled in California in the early 1980s. 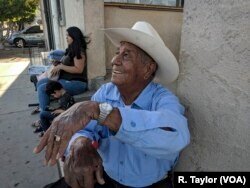 He maintains the Mexican border town was different then. Andrade makes his stance on the wall clear — “go for it!” — but others who claim illegal immigration is a danger have other ideas. Bill DuBois, an El Centro-area resident and owner of a local firearms store, holds firm that “if one illegal crosser gets across, the border is not secure.” But unlike Andrade, the lifelong Californian doesn’t subscribe to the idea of a wall. “The only way to solve the problem of illegal immigration is to make things better in the other people’s home countries,” DuBois said. Will the Supreme Court Kill DACA?